Update! Higher resolution image at the bottom of the post. The likeness of the Virgin Mary has appeared on the side of a building along Apia Harbour. Which building? Wait for it. Wait for it. The Congregationalist office building. That’s right. 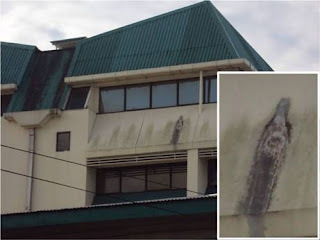 People at the scene are claiming Lady Madonna stamped her image on an awning of the John Williams Building, which is owned and operated by the Christian Congregationalist Church of Samoa. As dusk fell this evening, the crowd seemed to be growing. On the morning of the Road Switch, as I took a picture of the police officers guarding the intersection near my house, a Samoan drove up and leaned out the window of his car to take a photo with his camera. It was the first indication of how momentous an event the Road Switch was. Walking away from my intersection, I remarked to Phil how rare I thought it was to see a host country national taking photos. So I knew something was up when, taking the shortcut around the back of the John Williams building, I turned the corner and saw a dozen Samoans looking up into the sky, at least 3 of them taking photos. It was one of those scenes out of Candid Camera where I found an entire crowd staring off into the distance, so I went and stood with them and stared in the direction they were staring. I have expected Allen Funt to step out from behind some van in the car park. It took only a moment for me to figure out what all the commotion was about. 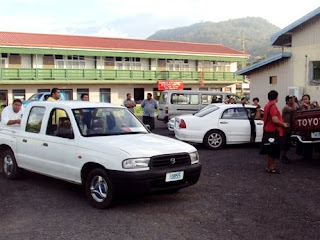 I love a good spectacle, and what could be a bigger spectacle than the Virgin Mary showing up in Samoa? Apparitions and visions are a big thing here. When I went with the Catholic youth group from Mulivae out to see the new cathedral (basilica?) on the western side of the island, the priest who accompanied us told detailed accounts of Juan Diego and Our Lady of Guadalupe and the Portuguese kids and Our Lady of Fatima. I’ve never seen an apparition, hoax or otherwise, in person. I remember when the lady from the Midwest sold the grilled cheese sandwich with Jesus’ face on eBay. And I remember watching a news story at Marlis’ house a Little Caesar’s ad in which people said they saw the face of Jesus in spaghetti. But never with my own eyes, so today is a big day. It looks like the rain gutters on the John Williams building leak at certain joints, and water fans out from those spots. The apparition has a similar fanning-out shape, but is darker in colour and slimmer in its fanning. I find it slightly amusing the image has appeared on the Congregationalist’s building. There are dozens of Catholics milling around the car park. And what statement is Mary making? Is she endorsing the Congregationalists or trying to convert them? Perhaps it’s a call to ecumenicalism? 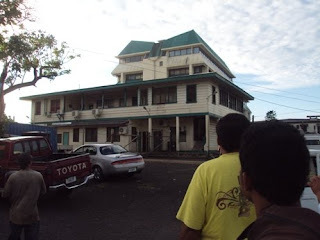 The security guard who works at the National Bank of Samoa across the street wasn’t convinced. “Maybe someone just drew it on there,” he said. I was the only one who pointed my camera at the crowd. I think people were weirded out. Higher resolution image. Click to see it big. Sorry, I think it looks more like a soda or beer bottle. However, with the economy and the road change, perhaps a vision of Mary is needed to give everyone a boost of faith. The other splotches I'm guessing will emerge as a kneeling Tuilaepa and his Cabinet. Wouldn't read too much into the image appearing on the CCCS Bldg; prophet Oka will reveal all in due time. However the CCCS is always short of money for its next white elephant project and the image is not likely to disappear soon because the church never spends anything on maintenance. I would recommend a scaffold/platform to within 15 feet of the image and tickets at $10 for 3min viewing. A bargain for this once in a lifetime event. I was wondering if you could post a link/image, of/to a higher resolution image of the Blessed Virgin Mary, if at all possible. By my old folks especially! And btw, excellent blog - your news gets around the world faster then the Samoan Press or Newspapers, lol. For a better look at the Virgin Mary photo, follow this link. Original (Normal) Photo provided by Matt's blog. Looks more like a coke bottle to me or a Digicel ad stunt about to go bad. I really hope we're not looking for Mary here. 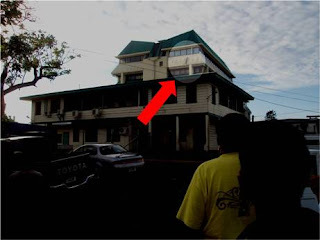 On her first trip to Samoa I doubt she was going to be on the roof of the Ioane Viliamu building in Apia. Always happy to read your blog. I agree with Saintpad, your news gets around the world faster than all the Samoan Press/Newspaper. When I saw the picture to me it's the image of St Theresa of the Child Jesus. Thank you Matt for sharing this online. I believe it is Mother Mary with baby Jesus. I would love to know what message she has for us this time. Great pic. 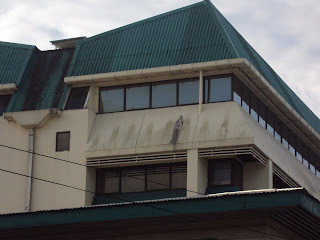 You should upload the recent apparition on the OTHER side of the building. Its one of an adult Jesus. Just take a walk to the corner of the EFKS church across the road, stand next to the traffic light and look up to the very top of the building. The image is there at a 2 o'clock direction. And there is talk there is a third apparition in the very FRONT of the building . It appears you have hit on to something here, please keep the pictorial updates happening. This is going to be bigger story than the road side swictheroo as far as newsworthy is concerned. Already the media teams from around Australia and NZ have been despatched to document this whole 'miraculous' event in Samoa to lead the breakfast stories for tomorrow. See you all very soon at the rapture by the seawall. thanks Matt for posting the photos of the apparition. Mary, Star of the Sea pray for us. Mother Mary appeared to the people of Samoa to warn them of the Tsunami which killed over a hundred people. I heard there are words on the same building underneath her image saying 11 more days from 16th of October 2010. Keep praying the rosary if you're catholic as this is the month of the rosary and if you're not keep praying and asking for forgiveness. This is serious!!! If you look at the gutter above the head you can see a hole. The water has dripped and created this shape. As much as I want to believe and can say that is not the Virgin Mary just water that drip. You can tell rain is dripping from the roof because other areas are worn too. This is how I found your blog last year. My sister in Samoa asked if I heard about the Virgin Mary appearing in Apia. I thought she was crazy. Then I google(googled) and up came your site. Then I forgot about it until last week, now I'm reading your blog in the second week. My sister also mentioned a boat that was stuck in the wharf and the monike(Carmelites) prayed and the boat was freed, then the tidal wave. Too bad the Prime Minister didn't swept up in the tsunami an be "under the sea, under the sea."